The Cotswold Water Park is an area of 40 square miles, with more than 150 lakes, set across the countryside of Wiltshire, Gloucestershire and West Oxfordshire. It is approximately the same size as the island of Jersey and has been subjected to over 50 years of gravel extraction which of course now form the lakes. 1. Cotswold Water Park and 2. Cotswold Country Park & Beach. For adults and children of all ages. 150 lakes set in glorious Gloucestershire / Wiltshire countryside providing opportunities for a wide range of leisure activities all year round – from angling to archery, wakeboarding to windsurfing, birdwatching to rally driving, all within easy reach of the main Cotswolds destinations. It is a great destination all year round, with water sports and adrenalin fuelled fun in the summer months, along with wonderful dragonflies, bats, and orchids. In the quiet winter months, the area is a haven for winter waterbirds, with plenty of bird watching, quiet footpaths, and cosy country pubs. Stay a while in a fabulous choice of holiday accommodation, from five star luxury hotel to holiday cabins and campsites. 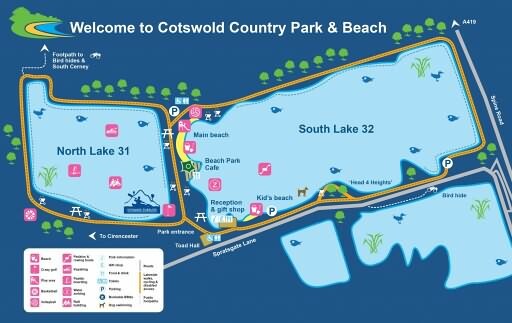 Cotswold Country Park and Beach is the number one attraction in The Cotswold Water Park. The Park is open year-round, and offers the largest inland beach in the UK, activities, boat and kayak hire, cafes and wonderful lakeside walks. Cotswold Country Park and Beach comprises two lakes formed around forty years ago through gravel extraction. The lakes are filled by the natural groundwater, which means they are very clean. In fact, you can usually see the bottom of the lake from the viewing gallery on the Millennium Building! In the winter, although many of the water based facilities close, the country park is still a great place to come for a beautiful lakeside walk and of course, have a hot chocolate afterwards.